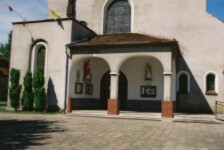 The parish church in Gorzyce Wielkie. Deep inside on the right there is the statue of Salvatore Mundi sculpted by PawełBryliński. In the middle of the village of Gorzyce Wielkie to 1939 there was a huge cross with the date of 1817 on it and which now graces the tower of the parish church. The Passion program carved on the pole of the cross could be a role model for Paweł Bryliński whose trail went through Gorzyce Wielkie. The reminder of the presence of Paweł Bryliński are the sculptures placed in the church - Christ Salvator Mundi, St. Joseph with the Child and Sorrowful Christ from the chapel in Lamki. In front of the church there is a cross dated on 1817 of an unknown author. In the arcade on the right there is a figure of Salvator Mundi. 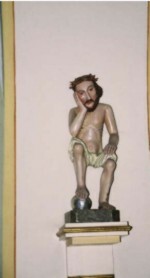 Sorrowful Christ from the chapel in Lamki, the statue by Paul Bryliński. Figure of St. Joseph and the Child, carved by Paweł Bryliński. Christ Salvator Mundi, carved by Paweł Bryliński.